Elon Musk’s venture in space exploration, SpaceX, has today announced that it will be sending two private citizens ‘to the moon’ late in 2018, in a move that’s a world-first for commercial space travel. In a statement on the company’s website, SpaceX announced that it “has been approached to fly two private citizens on a trip around the moon” and that “they had already paid a significant deposit to do a moon mission”. Specifically, the pair of cashed-up individuals will be taking off from Cape Canaveral, circumnavigating the moon, and returning to Earth – thus becoming the first humans in deep space for 45 years along with their crew, and ostensibly traveling further into our solar system than any humans before them. The company’s announcement also gives thanks to NASA for providing a considerable portion of the funding for the development of the second iteration of SpaceX’s Dragon rocket. This Crew Dragon (Dragon 2) will utilise the company’s own Falcon Heavy rocket, which it claims “will be the most powerful vehicle to reach orbit after the Saturn V moon rocket”. 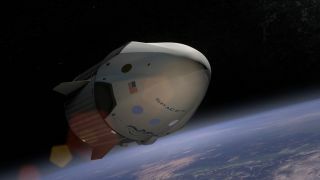 The Crew Dragon will see its first flight take place later this year as part of an unmanned mission to resupply the International Space Station (ISS), while the first manned flight is slated for the second quarter of 2018, leaving an ambitiously small window of time before the proposed commercial moon voyage.